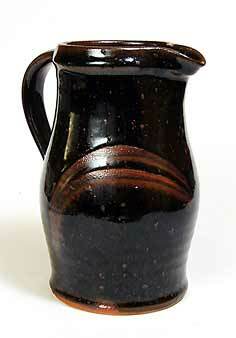 Decorated Scott Marshall jug - 7½" (190 mm) high. 2000. Scott was mixing three buckets of glaze - one bucket was to have six ounces of iron oxide, the next four and the third, two. After the second bucket the telephone rang and when he came back from his call he put the remaining two ounces in the wrong bucket! This is from the batch with eight ounces - the batch with none at all still produced an attractive glaze, even if rather pale by Scott's standards. When Scott Marshall left school in 1951 he was no stranger to the Leach Pottery in his home town of St Ives, Cornwall. His two uncles, Bill Marshall and Kenneth Quick worked there and Scott, who had a deep interest in pottery, became the third and last of the apprenticed potters at the Leach Pottery. After ten happy years there - he would smile as he recalled the stories that Bernard would tell of his travels, sometimes starting in the morning coffee break and carrying on to the afternoon tea break - he left to start Boscean Pottery near St Just, Cornwall where he continued to pot until his death in 2008 at the age of seventy-two. After ten years at the Leach Pottery in St Ives, Scott Marshall left to start Boscean Pottery with Richard Jenkins in St Just, a few miles from Land's End. They built their own oil-fired four chamber climbing kiln, big enough to fire 3,000 items at a time. It was capable of reaching very high temperatures and enabled them to produce some beautiful rich dark glazes. After the death of his partner, Richard, Scott found the kiln, which had been so convenient and versatile for large-scale production, too large for the limited output of one man. He tried using only two of the chambers, but found it impossible to reach a temperature greater than 1,200° C. The kiln was demolished in 1981 and an electric kiln took its place. Scott watched as the kiln, which had taken the best part of a year to build was flattened in half a day. He used some of the wedge-shaped bricks to pave a path to the front door of his studio. Scott operated Boscean Pottery until his death in 2008, producing the type of work that he is well known for in natural colours. His son, Seth, gave up pottery in early 2000 in favour of painting, which is pottery's loss. He made very attractive highly coloured items that complemented his father's work.